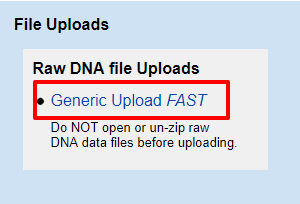 After you have created an account at GEDmatch, click on the Genetic Upload FAST link. You may upload many kits to work with. 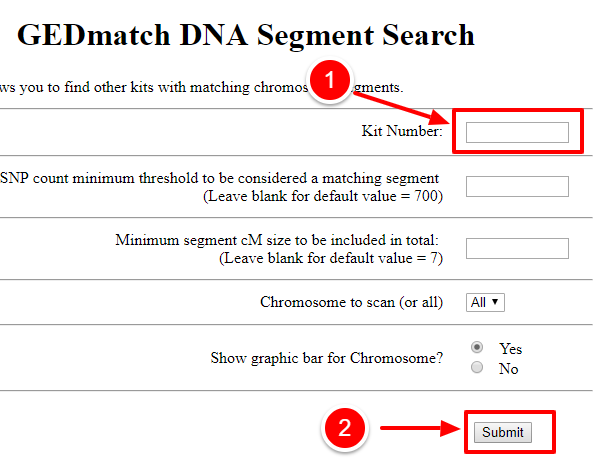 At the top of the next page, you will see a series of links to instructions for various DNA sources. Follow the direction for your DNA source, i.e. Ancestry, FTDNA, MyHeritage, etc. Answer the questions on the page. At the bottom of the questions click on the link to choose your data file and then upload. You will need to purchase Tier 1 membership to obtain segment and triangulation data. Scroll down the page and find the number for the kit you are working with on left side of the page. The kit number will listed with the name of the other of the kit. You may have loaded many kits to work with. Copy the kit number. You will be using this number several times. Next, find the Tier 1 box on the left side of the page. And select "One-to-many matches." Enter your the kit number GEDmatch has assigned to this kit. Set the limit at the desired level. Set cm size at desired level. Note, sometimes GEDmatch gets overwhelmed and may appear to be finished when it is only resting. Please scroll to the bottom of the page. Make sure you see the "Visualize Options" button at the bottom. Your One-to-Many spreadsheet will look like the example below. Once the DNA Matches are displayed, press Control-A (for PC users) or Command-A (for Mac users), then Control-C (for PC users) or Command-C (for Mac users) to copy the spreadsheet. After you have copied your one-to-many data from GEDMatch, open a tab for RootsFinder. Open your DNA profile page by clicking on DNA in the left side menu. (Notice that there are several profiles on this sample page. You may have as many profiles as you like but they must connect to someone in your tree.) Click on the DNA profile to which you wish to paste your data. This will take you to the page where you will paste your one-to-many data. 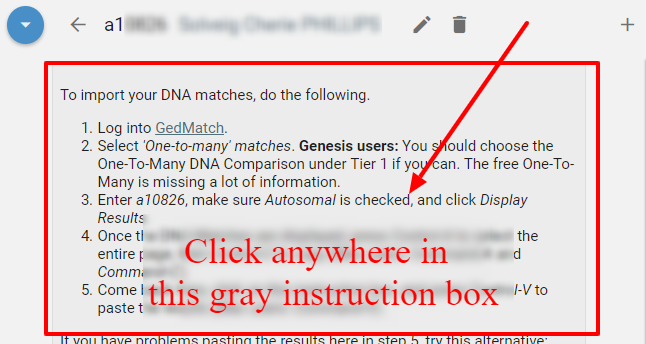 Click anywhere in the gray instruction box and then, press Control-V (for PC users) and Command-V (for Mac users). After you have copied your one-to-many report, you will want to copy your Segments and Triangulation. Your DNA reports must be pasted in order, first the One-to-Many, then the Segment Search and finally, the Triangulation report. The circle view will load after you have pasted both the Segment Search and Triangulation report. Use the same steps as described above to the additional spreadsheets. For more detailed instructions for Segments and Triangulation, see below. 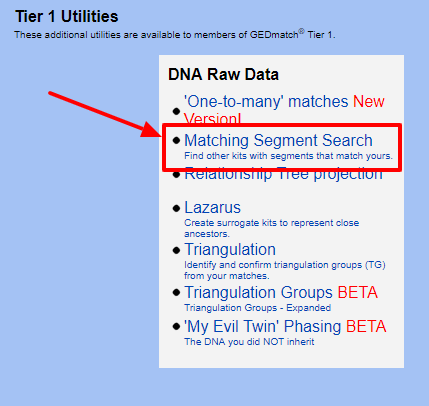 From GEDmatch, scroll down to the Tier 1 Utilities box and select Matching Segment Search. GEDmatch will think for a while. Your spreadsheet will look like this. Sometimes, GEDmatch gets overwhelmed and rests. It may appear that spreadsheet is done but is not.Before you copy your segments, scroll down to the bottom and make sure you see the total number of segments. When you see the total number of segments at the bottom, you are ready to copy the spreadsheet. Press Control-A (for PC users) or Command-A (for Mac users), then Control-C (for PC users) or Command-C (for Mac users) to copy the file. Go to RootsFinder Segments page, click in the gray instruction box and press Control-V (for PC users) or Command-V (for Mac users). After your segments are copied into RootsFinder, you are ready to copy your Triangulation. You may paste the Triangulation report into either the Triangulation page or the Circle View page. 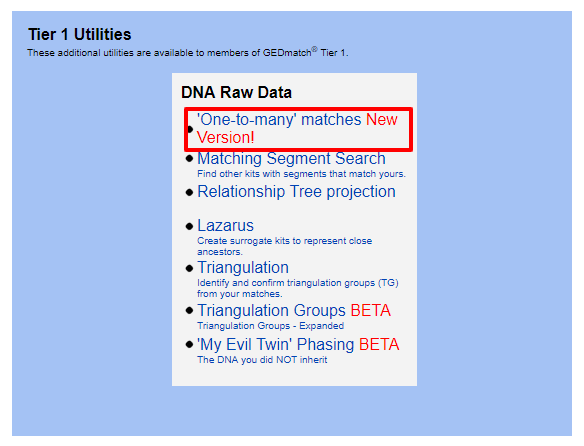 Go back to GEDmatch and create the Triangulation report. Scroll to the bottom and make sure it is finished and you see the number of Triangulated Segments. Then, press Control-A (for PC users) or Command-A (for Mac users), then Control-C (for PC users) or Command-C (for Mac users) to copy the file. Go to RootsFinder Triangulation page, click in the gray instruction box and press Control-V (for PC users) or Command-V (for Mac users). The circle view will paint its page shortly. You may add kits for other people. However, those people must first be in your tree. It is possible to add person to your tree who are not connected to anyone by clicking on People in the left side menu and then clicking on the "+" in the upper right of the people screen. For step by step directions, please see the Updating and Deleting help page.